Today, as the newest ichthyologist at the Virginia Institute of Marine Science, Hilton’s research focuses on the anatomy of fishes. From lakes to rivers to the ocean, there is an astonishing diversity of fishes, each with a different evolutionary history to share. What kind of information? Hilton and other ichthyologists use specific details of anatomy to learn about the daily operation of fishes—what and how they eat, for instance—to unlock the mysteries of their evolution. Whether it is the slingjaw wrasse thrusting its jaw half a body length to capture food or the pipefish sucking plankton like a vacuum cleaner through its tubular snout, “we see that what fishes eat can drive their shape and structure,” says Hilton. 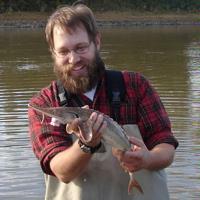 There are around 30,000 species of fishes, but Hilton has concentrated much of his anatomy career studying the 25 species of sturgeons. One of the older scientific disciplines, comparative anatomy was established at least by the mid 1500s—some consider Aristotle to be among the first comparative anatomists in the 4th century BC. Recent advances in high-resolution imaging, however, have invigorated the field and will allow researchers like Hilton to gain new insight on rare species. But, Hilton notes, there is no substitute for traditional dissections. A few years ago, Hilton was privileged to collect a specimen of a basking shark, a species that is unusual in natural history collections for obvious logistical reasons. “It was a relatively young animal, and only 27 feet long” Hilton recalls. The 1,500 pound head of the shark was eventually loaded into the bed of his truck via crane and he chuckles to recall the strange glances he received from the toll-booth attendants while transporting his bounty to the lab. Every day for several weeks, Hilton worked to complete the shark dissection. “With blood vessels nearly 2 inches in diameter, I got such a better understanding of the shark circulatory system using just a knife and careful observation,” says Hilton.